TACLOBAN City – THE House independent bloc will file a resolution expressing deepest gratitude to Pope Francis on his five-day visit to the country and for showing great concern to Filipinos, especially to the survivors of super-typhoon Yolanda. House independent bloc leader and Leyte Rep. Martin Romualdez said Pope Francis deserves special appreciation and gratefulness for consoling the Filipinos and assuring them that God is always there for the people. “The nation through Congress can return the favor to the Pope by expressing our deepest gratitude to him through a congressional resolution,” Romualdez told reporters in an interview, recalling the big blessing the other day that Tacloban City received after the Pope officiated Holy Mass near the Daniel Z. Romualdez Airport. Romualdez maintained that the resolution will only focus on expressing special thanks to the Pope, rejecting any congressional award so that it would not be deemed as “epal” (or opportunistic). “I believe that no congressional award could match the Pope’s holiness. The most fitting is for us in Congress to express our deepest gratitude for his concern to Filipinos and the country,” said Romualdez. Filipinos and he [also] touched the lives of so many people,” said Romualdez. 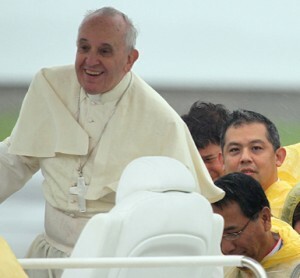 “[His] visit made the faith [in] God of many Filipinos stronger than ever,” he added. Romualdez thanked Pope Francis for blessing his constituents during Saturday’s Holy Mass here despite heavy rain, hoping that his “personal touch” in expressing love and compassion to super-typhoon Yolanda survivors will expedite government efforts to rebuild the devastated areas. “Let us all thank Pope Francis personally for continuously praying for our immediate recovery from [the] poverty, difficulties, and sadness that Yolanda had brought us. We are indeed powerless without God and our strong faith in Him made us resilient and powerful to face all these challenges,” Romualdez stressed.